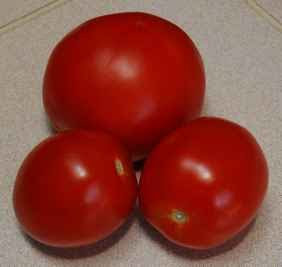 If you planted tomatoes in your spring vegetable garden in Texas, you probably have been enjoying the fruits of your labor for a while now. However, if you didn’t get any in the ground, it’s not too late to enjoy fresh, homegrown tomatoes from your garden this year. Between now and the Fourth of July is prime tomato transplant planting time in North Texas for a fall harvest of tasty tomatoes. Just as with spring plantings, and possibly even more important in our summer heat, you should pinch off the lowest set of leaves on your transplants and set the plants deep in the ground, almost up to the next set of leaves. 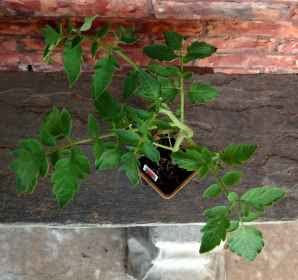 The tomato plant will grow roots along the buried stem. You will have to be attentive to the watering needs of your new transplants, but if you are, you will be amply rewarded. Whether your tomatoes are home grown or store bought, you want to maximize their storage potential. I discovered an interesting tip for storing tomatoes in a recent America’s Test Kitchen’s “Notes from the Test Kitchen” e-mail. You can read about their tests and results. It’s amazing how something so simple can make such a big difference. May the tomato fairy be good to you. Birthdays that end in zeros, 25th anniversaries, promotions, graduations and many more milestone events are markers along our life’s journey. While these things can all be great accomplishments, they can also bring along a certain amount of stress. Injecting a little humor can be a great stress reliever. My husband and I injected a little humor by making my son a custom birthday card. In the week before his birthday, a combination of photos that I had previously taken, my husband’s wit and my son’s imminent milestone birthday gelled into a card that he really got a kick out of. 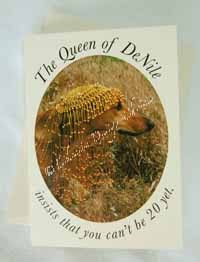 The dog is my son’s greyhound and the headdress just seemed like it would be a perfect portrait prop for her. She has always reminded me of a lioness when she hangs out in the tall grass, so we let some grow for the photo shoot. 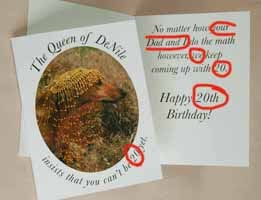 From there, add a touch of my husband’s humor and my son’s 20th birthday and a card was created. If you have your own meaningful photo and wording, you too can create a custom card for any milestone event in your life. Most office supply stores now sell packages of note cards that you can print on your printer. I use Adobe Illustrator to set up the card design and print them on my laser printer. If you don’t have the desire to tackle this, I can put together that custom card for you. Also, with my son’s permission, his birthday card is available with customization for your milestone event by custom request through EDCCollective. I have a friend that loves the color yellow. 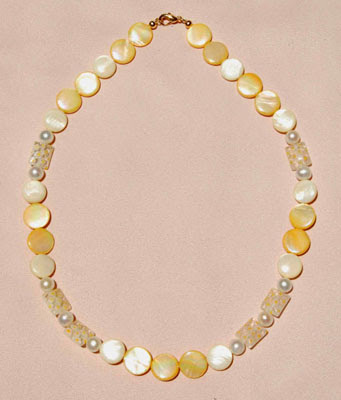 I thought of her after I had put together a necklace that included some pastel yellow gemstone teardrops. I sent her the link and though she liked it, it was not yellow enough for her, however she liked the thought of a custom yellow necklace. A week or so later while I was rummaging through my materials for inspiration, I noticed/remembered a variety of beads that I had picked up at different times that were a more intense yellow than the teardrops were. I took a photo of the beads(1) and sent them to my friend to see if they sparked her interest. While she was pondering my offer, I decided that even if my friend didn’t want a necklace at this time, the colors in the beads would make a great necklace for accessorizing summer outfits, so I got to work on a design. I sent my friend a photo of this(2) before I strung up the beads. By this time my friend had an idea of what she wanted. 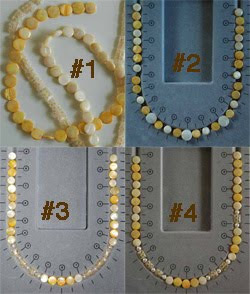 She wanted to use the three types of beads from the first photo along with freshwater potato pearls. I put together a design and sent another photo(3). She suggested a small change which I made to one side of the necklace so the she could compare the two designs(4). This was a winner except that the necklace would now be a little longer than my friend wanted so I removed one bead from each end of the necklace for the final version and strung it up. I enjoy sitting down with my assortment of beads and having the beads suggest a design like my most recent, summertime inspired, necklace and earring set. However, it is really gratifying to be able to fulfill a specific request for something that a customer is looking for. I look forward to my next design challenge.